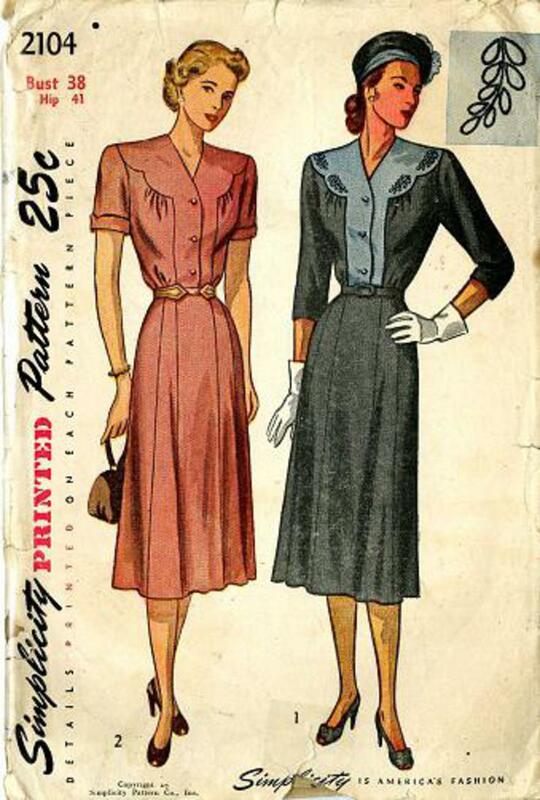 1947 Simplicity #2104 vintage sewing pattern, misses' V-neckline scalloped yoke day dress, plus size bust 38. The front-buttoning bodice, styled with a V neckline, features a scalloped front yoke. The yoke, cut in one with the front section, releases easy bodice fullness. The gored skirt falls in a soft flare. In style 1, embroidery for which a transfer is included, trims the contrasting yoke. The dart-fitted sleeves are three-quarter length. Style 2 has a short sleeve with a scalloped cuff.